RFP for empanelment of Industry as Training Providers for PMKVY 2.0 under State Component is released by Gujarat Skill Development Mission (GSDM). This is open till the targets are available with GSDM. Hence requested to apply at the earliest. To Download RFP Click Here. 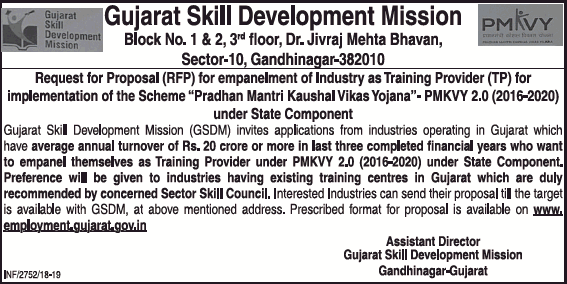 One may approach GUJARAT SKILL DEVELOPMENT MISSION for further details at below address. For further assistance please write to Ms. Nidhi Panchal (gsdm.pmkvy@gmail.com) NSDC’s state representative placed at Gujarat with a copy to Dr. Vijay Yadav (vijay@texskill.in).